- Exceptionally even heat distribution. This allows you to prepare meals without having to worry that food is not evenly cooked/heated. - Better heat retention. This allows you to take the roaster off the heat and still keep its contents warm before serving. 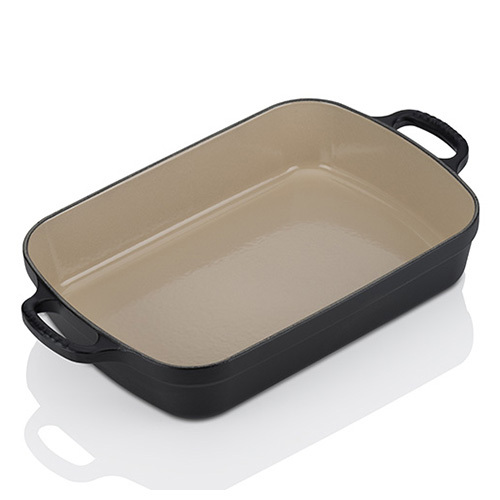 - Attractive finish, this Le Creuset roasting dish can go straight from your oven to your table, saving time on washing up! Each piece of Le Creuset cookware also comes with a lifetime warranty and you can rest assured that it is dishwasher safe. Choose Le Creuset cast iron cookware for an attractive, practical solution to all your cooking needs. Suitable on ceramic, electric, gas and induction hobs, grill, oven and dishwasher safe.